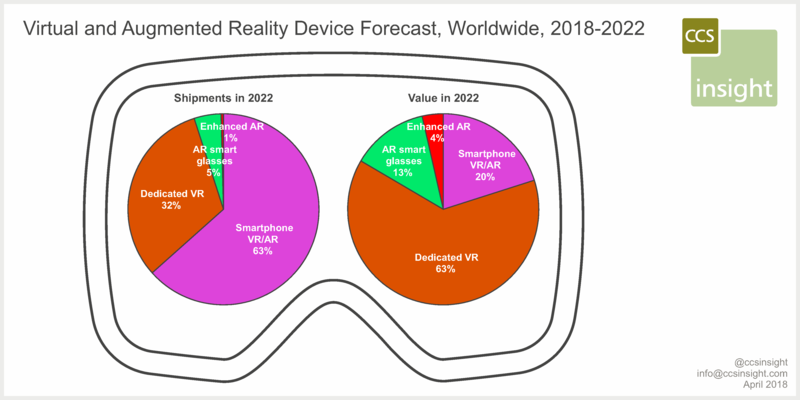 The latest forecast published by technology research firm CCS Insight shows the worldwide market for virtual reality (VR) and augmented reality (AR) head-worn devices growing by an average of 50 percent annually over the next five years. In 2022, a total of 121 million units will be sold, with a value of $9.9 billion. George Jijiashvili, CCS Insight's senior analyst for wearables, comments, "Virtual reality headsets have been the main source of growth in unit sales to date, and we expect this will continue, particularly headsets that use a smartphone. However, we expect stand-alone headsets like the Oculus Go and HTC Vive Focus to ignite a new wave of growth that will help broaden the appeal of virtual reality, particularly with businesses and in education". Gaming remains the primary reason for sales of VR devices and this is unlikely to change over the next few years. CCS Insight's consumer research shows that nearly 70 percent of customers who own a dedicated VR headset such as an Oculus Rift, HTC Vive or Sony PlayStation VR have bought games for it, and more than half of smartphone VR headset owners have bought games for their device. Jijiashvili notes, "There's a growing array of exciting new content being developed. We were encouraged to see in our latest consumer survey that virtual tourism, remote participation in events such as music concerts, and virtual social interactions are all emerging as further uses for virtual reality. Watching video is also proving popular, particularly on smartphone-based headsets". AR smart glasses also feature prominently in CCS Insight's forecast. As Jijiashvili states, "Given augmented reality is one of the hottest new technology areas in smartphones, it's not surprising that interest is mounting in augmented reality glasses. Billions of dollars are being invested in this technology and we've seen significant improvements in the size, weight and design of smart glasses over the past 12 months". However, CCS Insight's forecast signals disappointingly low adoption of smart glasses to date, particularly among businesses. CCS Insight estimates that just 24,000 AR smart glasses were purchased by business in 2017. Jijiashvili comments, "The potential of this technology is clear, but so far most companies are evaluating a few units to see how the technology fits into their operations". CCS Insight expects consumer smart glasses to develop differently from enterprise-centric products. The research firm believes that consumer demand for smart glasses could build in a similar manner to other new smart products. Jijiashvili notes, "We're encouraged by the technology developments in smart glasses for consumers. Products such as Intel's Vaunt glasses are a clear signal of the direction these devices are moving in, with a design little different from a pair of standard prescription glasses. It only takes a big company like Apple to jump into the market and we could be looking at market of millions of smart glasses in no time at all". CCS Insight's latest forecast reflects the positive outlook for consumer smart glasses, with sales volume of 4.5 million units predicted in 2022.